Among several sustainable resources, marine heterotrophic microorganisms have gained much interest for various commercial applications owing to their potential to produce high quantities of polyunsaturated fatty acids. Above 70% of the globally produced fish oil is utilised for aqua feed formulations. Intense research is being carried out to find suitable alternatives to fish oil. Oleaginous protists are being explored as a promising substitute to fish oil and also for various high-value-added products. However, characterisation and utilisation of these unique protists remain underexplored in many countries including India and this prompted us to screen and isolate these heterotrophic microorganisms capable of producing PUFAs. 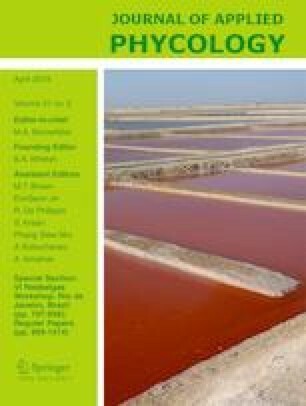 In this study, 11 strains of heterotrophic thraustochytrid capable of producing significant quantities of polyunsaturated fatty acids were successfully isolated from different mangrove habitats along the southwest coast of India. Morphological characterisation along with molecular identification revealed that these strains showed close similarity to Aurantiochytrium spp. of the family Thraustochytridae. They are able to produce 7–11 g of dry biomass per litre of culture. Their fatty acid content was up to 12% (wt/wt) of biomass and GC analysis confirmed that these protists can accumulate docosahexaenoic acid as high as 22–60% of the total fatty acids. Their enzymatic activity, tolerance to various abiotic stress factors and antagonistic potential against vibrios are also described. These heterotrophic protists can antagonise aquaculture pathogens and act as an excellent source of docosahexaenoic acid that indicates their potential as a sustainable alternative to fish oil. The authors are thankful to Dr. A. Gopalakrishnan, Director, CMFRI, for his generous encouragements and to Dr. P. Vijayagopal, Head-in-Charge, Marine Biotechnology Division, CMFRI, for providing the necessary facilities to carry out the research. The Senior Research Fellowship received by the corresponding author from the UGC, New Delhi, is gratefully acknowledged. This work was supported by University Grants Commission (UGC), New Delhi, Ministry of Human Resources Development, Government of India [F.2-5/2009(SA-I)].